Discover the secrets hidden in the shadows of America's most historic and most haunted city! 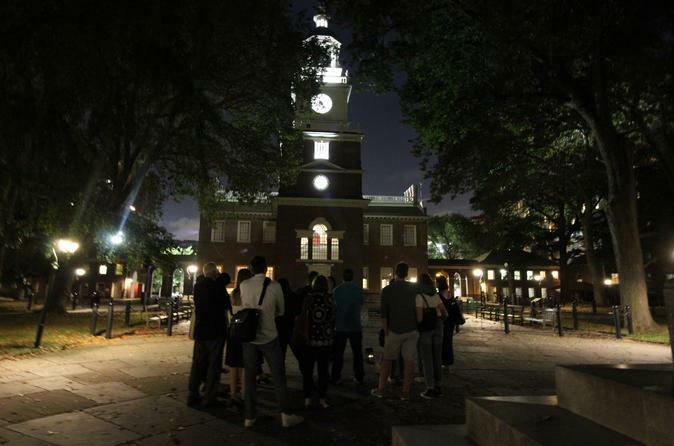 Join the Ghost Tour of Philadelphia for a candlelight walking tour along the back streets and secret gardens of Independence Park, Society Hill, and Old City, where ghostly spirits, haunted houses, and eerie graveyards lurk in the night! Experience history brought back to life with a costumed tour guide spinning tales of mystery and intrigue. Hear seldom-told tales about the city's historic sites, such as Independence Hall, Washington Square, Powel House, City Tavern, and more. In the shadows of Philadelphia's historic streets, mysterious legends and dark secrets are waiting to be unearthed! Your tour begins at Signers' Garden at 5th and Chestnut Streets, in the heart of Philadelphia's historic district. A costumed tour guide will lead you off the beaten path, down back streets and through secret gardens, sharing tales of the rich and famous, heroes and villains, plague and pestilence, hidden burial grounds, and more. The guide will take you past historic sites in Independence National Park, Old City, and Society Hill, while narrating the history and ghost stories. The tour is family friendly.